How the fields looked yesterday as they were collecting generous flakes of sticky snow. An irresistible sort of snowfall. *The middle image is an in-camera double exposure (digital), the others are not. It was beautiful, Isabella – even better in real life. Thanks. Karen, you’ve managed to capture the experience of being there. Oh those big unwieldy, clunky, intricate, complex snowflakes! I like your description of huge snowflakes. Thank you! Eeking out a record number of snowless days here in Wisconsin feels eerie and odd. It’s raining now. Would that it were snow…. Oh, I hope you get snow soon, Scilla. We’ve just a little bit at the moment and it doesn’t look like any other big amounts soon. I’m looking for more snow, too! It’s very interesting, I didn’t noticed the second one was Double exposure. I like the idea of your brain only taking in the atmosphere – Like an impressionist photograph. Thank you, Yoshizen. It was, Karine. Thank you! So beautiful! I’m just a tad envious of your snow. We’re waiting…:-)! We don’t have much snow and now it’s all crusty from freezing rain. Here’s hoping we both get snow soon! Thank you, Marcie. you really are a snow queen. the wintery photos just nail it every time. I do love the snow and winter. Thank you! Wonderful photos! I can sense the beauty of the winter. Yesterday we had the first snow in Berlin and the atmosphere of the city changed completely. Now everything seems to be so quiet and romantic! Snow changes everything, doesn’t it? It softens all the hard edges and muffles the sounds. Thank you, Anette. Enjoy! Those are outstanding winter/snow scenes Karen! Looks cold though. We have temps in the 70s F here today so it’s still shorts and T shirt weather. It is much colder today! Enjoy your lovely weather, Phil. And thank you! I find those big-flaked snowfalls magical, too. Thanks, Adrian. Love, Love, Love the look of that snow.. but I’m awful glad it’s there and not here ! Thanks, Helen. I’m hoping for more! I particularly like the atmosphere/the magic of the first image. I can hear the quiet and I know that is possible. Lovely photos, Karen. Oh yes, that muffled quiet of snowfall… Thanks, Judy. The plants are so raw and tough, but I can almost hear the snow falling. Wonderful contrast, and beautiful shots. Hi Richard, thank you. It was very nice being there watching the huge flakes sailing down. a magical wonderland in your delicate style! Oh I’m so jealous of your snow..! Just loving these – I like how the last one has an ambiguous sense of scale to it – are we high up looking at trees or deep to the ground? And I like this almost widescreen effect too very much..definitely exhibition pieces..
Do you get a bit of snow where you are, Cath? Your’e welcome – your work always makes me think! We do get a bit of snow, actually the last couple of years a bit more than usual, but it’s never for very long and rarely deep, certainly nothing compared to yours! I’ve always dreamed of seeing Canadian snow! Yes driving can be difficult at times but I do love the beauty of snow. Thanks, Jane! Unbelievable. I don’t know how you manage to get so much power into your photos. Gabriel, I appreciate your kind comment. Thank you! So beautiful, Karen, you have such a wonderful style. Thank you very much, Ashley! but… wow! I’ve found myself thinking only nice things about snow! Beautiful! A snow convert, excellent! It was a beautiful snowfall, I’m glad you like these. Thank you. Falling and settling, and as you say, irresistible! 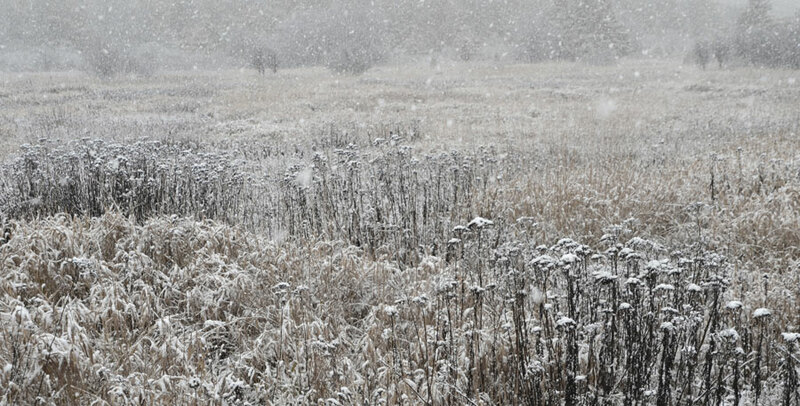 Yes, those big flakes on a warmish day – always beautiful. Thanks, Patti. Very gorgeous!!! I couldn’t believe I was caught without my camera when it was snowing! Reminder to self to not leave home without it! Thanks, Anita. I have been in that situation a few times myself. Me too, Inga. Thank you! Beautiful and delicate…like a place in my winter-loving heart…. I like these a lot – with luck we will get a few days like this in UK later this month…. Get shot for saying this as the country does not seem able to cope with the stuff, but there is nothing like nice crisp new snow and frost. I love the freshness of it. Thank you, David. I love the freshness of it, too. Like it cleanses the landscape for a while. I guess you go to the UK for Christmas. – Happy travels and I hope you get a bit of snow!